Tour Itinerary for the Places of Resurrection tour to Ireland on May 15-24th. 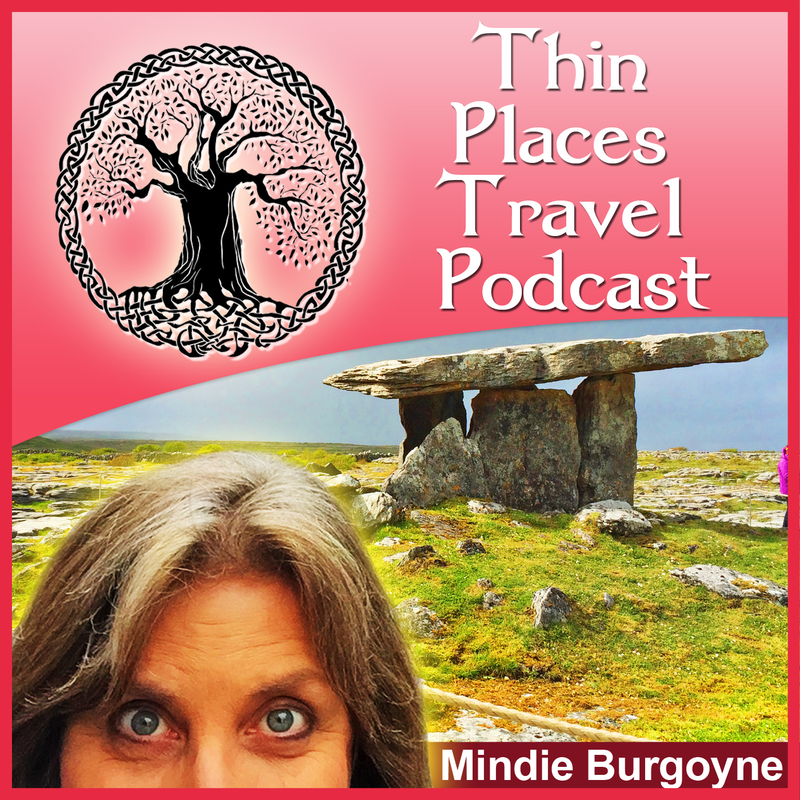 Visits to over 30 sites including the Burren, Aran Islands, Beara Peninsula, Dingle, Killarney, Limerick and the largest stone circle in Ireland. 9 days with 18 visitor excursions. The Itinerary listed below gives a brief overview of the sites and schedule of events. Though reservations have been secured for each venue, there is always the possibility of a change in schedule or unforeseeable circumstances that warrant a change. Therefore all items are subject to change. Approach to Allihies on the Beara Peninsula. Day 1 – FRIDAY – May 15th – Welcome to Ireland! Guests arrive at Shannon Airport and are transported to their hotel in Limerick’s City Centre. Guests may not be able to check in before the afternoon check in time, but luggage can be stored at the hotel. 2:00 group meeting in hotel lobby followed by a fun group activity and city walk. Welcome dinner will be at 7pm in the hotel. 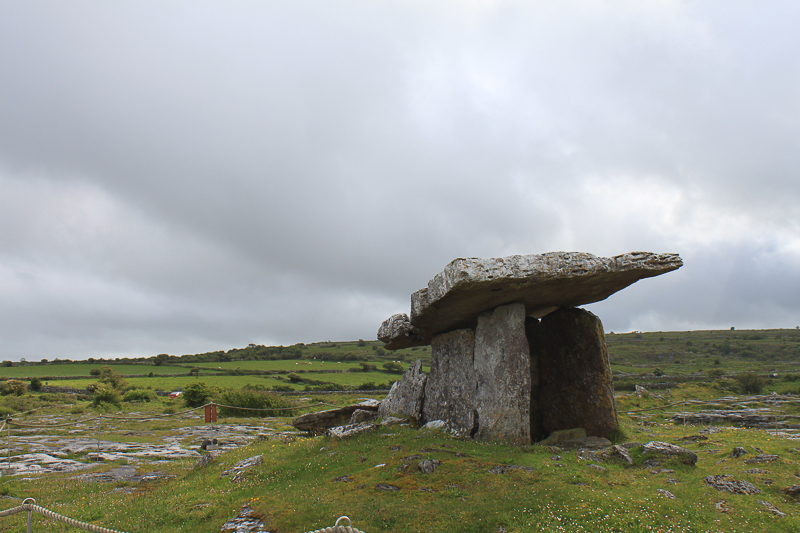 Enjoy a Tour of the Burren with guide, Tony Kirby from Heart of the Burren Walks. The Burren landscape covers over 150 square kilometres and is one of Ireland’s 6 National Parks. The region is visually similar to a moonscape, yet shelters a mixture of flora and archaeological sites which have attracted visitors for centuries. Man came here over 6000 years ago, cleared the forests and set in motion soil erosion. Centuries of weathering has produced a terrain of fissured limestone pavements, disappearing lakes, terraced mountains, and underground cave systems. For millennia, man has left his mark, megalithic tombs and cooking sites litter the pavements while medieval tower houses and churches guard the valleys. Today man is absent from most of the upland, leaving behind ancient field systems, routeways and placenames. Today’s visitors to the Burren will find Arctic, Alpine and Mediterranean plants growing together. On arrival in Ennis enjoy a tour of Ennis Friary. Ennis Friary, established in County Clare in the 13th century, was once renowned across Europe as a centre of learning. Throughout medieval times, the O’Briens were the principal patrons of these Franciscan friars and likely the reason they settled in Ennis Town. Among the remains, visitors can view various 15th and 16th century sculptures, the figure of St Francis displaying the stigmata, an image of Ecce Home, the McMahon tomb and more. The final excursion for the day will be a Walking Tour of Ennis with a local guide. Situated on the banks of the River Fergus, Ennis is a medieval town with narrow streets. The O’Briens, Kings of Thomond, built a castle and a friary here in the 13th century. However, only the friary remains today, and it remains Ennis’s most historical site. Monuments to commemorate Daniel O’Connell and Eamon De Valera (two important figures in Irish history) can be seen. The courthouse is a classical building dating from 1850. You can also see a Roman Catholic Cathedral dating from 1831 with furnishings of 1975. Today Ennis is home to just over 16000 people and growing rapidly. There is a market held every Saturday in the old market centre of the town, almost recreating the busy market atmosphere, which might have been in medieval times. Lunch and dinner under own arrangement. Overnight – Old Ground Hotel in Ennis. 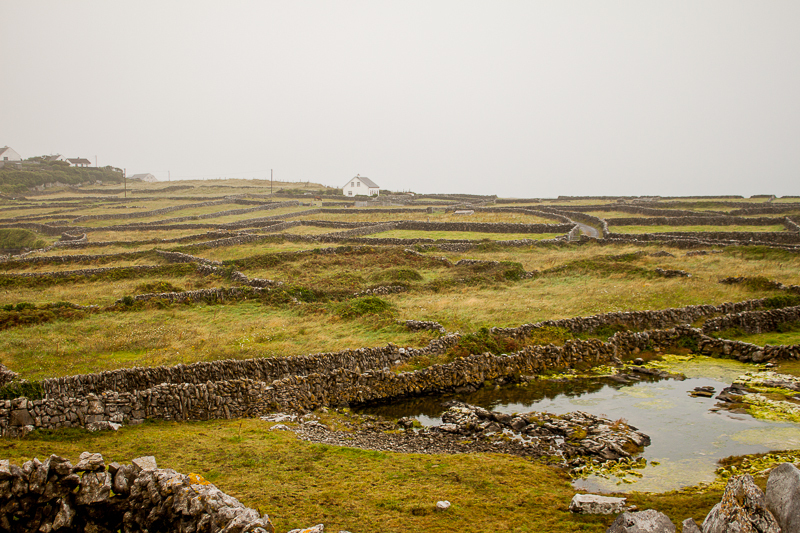 Take the ferry from Doolin to Inis Oirr and enjoy a complete day on the island. Inis Oírr is the smallest of the three Aran Islands (1,400 acres) and is an outcrop of the famous Burren Landscape in Co Clare. Having an abundance of flora, fauna and nesting birds, it is a haven for botanists and nature lovers. The everyday language of the islanders is Irish and their stories and songs enshrine much of Ireland’s folklore and ancient culture. Inis Oirr is home to about 300 islanders. 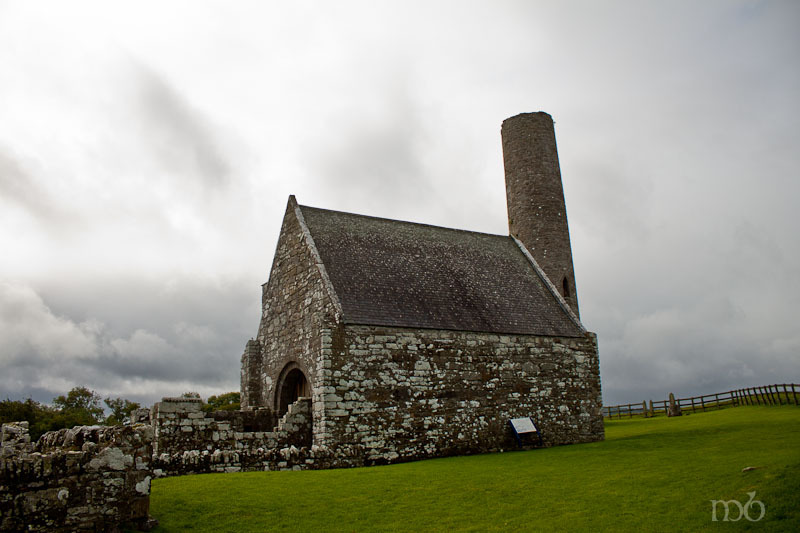 On the island you will visit St. Gobnait’s Church, St. Kevin’s Church, O’Brien’s Castle and you may even see the remains of an old wrecked ship. St. Gobnait’s Church – This small Church located to the west of the main pier, dates from the 10th century and replaced an earlier church. The church is named after St. Gobnait, the patron saint of travelers and beekeepers. Before settling in Ballyvourney, Gobnait came to Inis Oirr from County Clare to escape from enemies. She later went on to Ballyvourney. 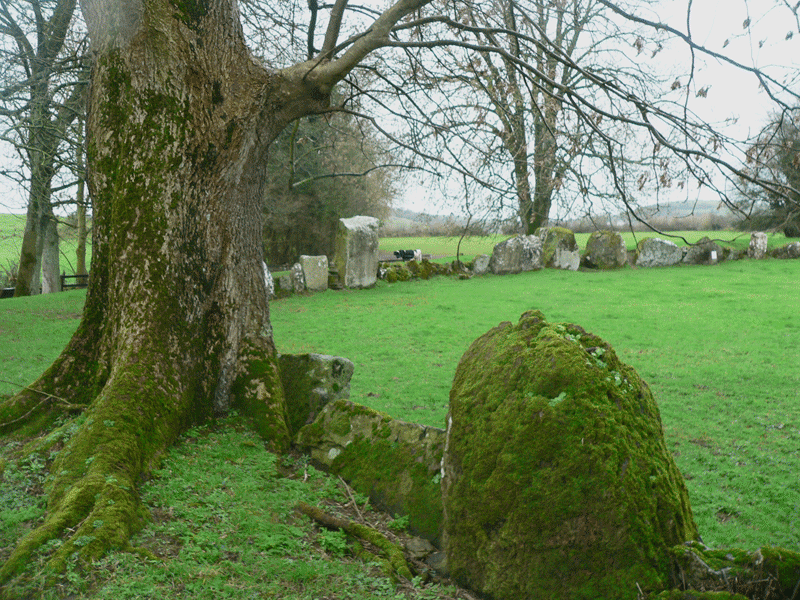 The small church remains still possess the original altar and outside there are several strange hollowed out stones. After a day on the island, you will take the ferry back to the mainland and return to your hotel in Ennis. Lunch and dinner under own arrangement. Overnight at Old Ground Hotel – Ennis. Travel to East Clare to Lough Derg and meet your expert guide, Ger Madden for a journey across the lake to Inis Cealtra – or Holy Island. Ger Madden is an expert in the Island’s history and traditions. He’ll lead you through the landscape that includes the ruins of six churches, a round tower and a cell-like structure which is one of the most extraordinary buildings in Ireland. Take the ferry back to the mainland and travel to Killarney. Optional fishing trip offered on this day. For guests who are interested, the day of angling will be on Lough Derg with a guide who will provide all the gear. Read more about this optional tour on the Fishing Trip on Day 4 page. Continue on to Gougane Barra Park. The name Guágan Barra derives from St. Finbar, who according to tradition built his monastery on the island here in the 6th century. Today Gougane Barra is known for its fine forest park. The park is unusual among forest parks in that it provides drive around facilities for the motorist and a motor trail can be followed right along the ring road. There are also a number of paths for those who prefer to walk. The Forest Park comprises some 142 hectares comprising largely of lodgepole pine, Sitka spruce and Japanese larch – three species that thrive in poorer soils and stand up well to the climate in this area of Ireland. Return to Killarney. This evening enjoy dinner at a local restaurant within walking distance of your hotel. Lunch under own arrangement. Group dinner in town – Overnight – Fairview Hotel, Killarney. The Beara Peninsula is the wildest and most romantic of the peninsulas in the south west of Ireland. The peninsula stretches for a distance of 48km from Glengarriff to Dursey Island and back to Kenmare. It presents an unspoilt and magnificent landscape, which sweeps from the spine of the Caha hills down to the shores of Bantry Bay and Kenmare Bay. Beara has unique distinctions as the northern part of the peninsula straddles South Kerry and the southern part is firmly rooted in West Cork. 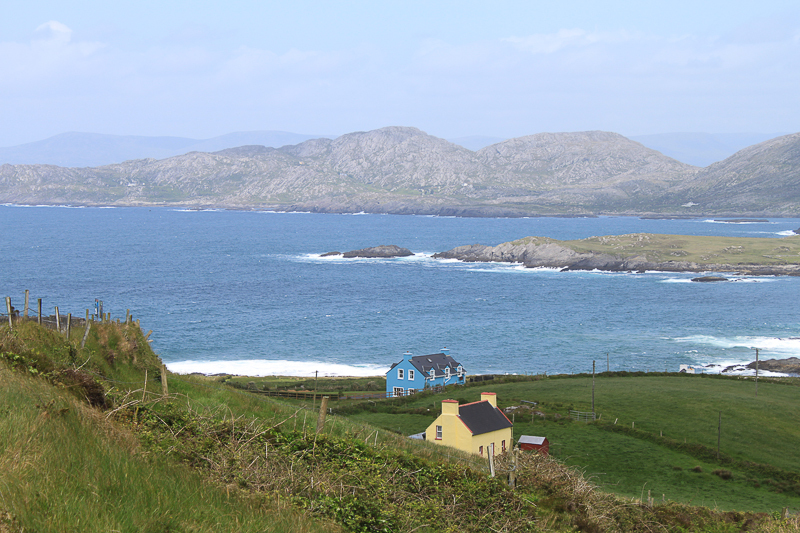 The appeal of the Beara Peninsula lies in its startling natural beauty. The Beara is desolate, a harsh and rocky landscape. This area enjoys a tropical climate due to the close proximity of the Gulf Stream and the local flora is lush and sometimes exotic. Visit Uragh and Cashelkeelty stone circles, two unique megaliths with amazing energy. Also take a walk out to the “Hag of Beara” a large rock on a hillside overlooking the sea where travelers leave tokens to honor the spirit of the hag or wise woman. Also visit the site where the Children of Lir are said to have died. Finally, take the cable car to Dursey Island at the end of the peninsula. Enjoy a stop in Castletownbere, the principle town on the Beara peninsula. It is the largest whitefish port in Ireland. Berehaven being the second largest natural harbour in the world. 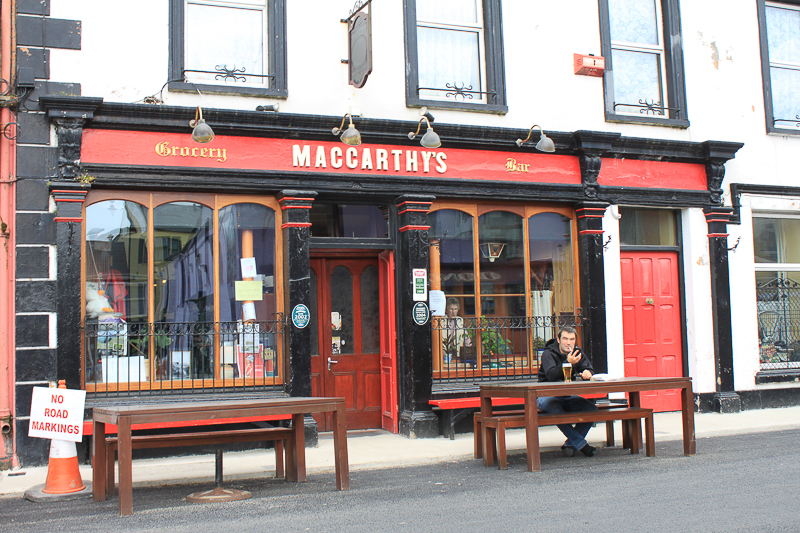 It is also home to McCarthy’s Bar, famously featured on the cover of a book by the same name written by Pete McCarthy. Then head back to Killarney. Some of the finest coastal scenery to be seen in Ireland can be found in West Kerry, on the Dingle Peninsula, the most northern of the Kerry Peninsulas. This peninsula is famous for its Celtic, pre-Christian monuments and Christian churches. It is also a ‘Gaeltacht’ (Irish speaking) area, where the Irish language and traditional ways of life are preserved. 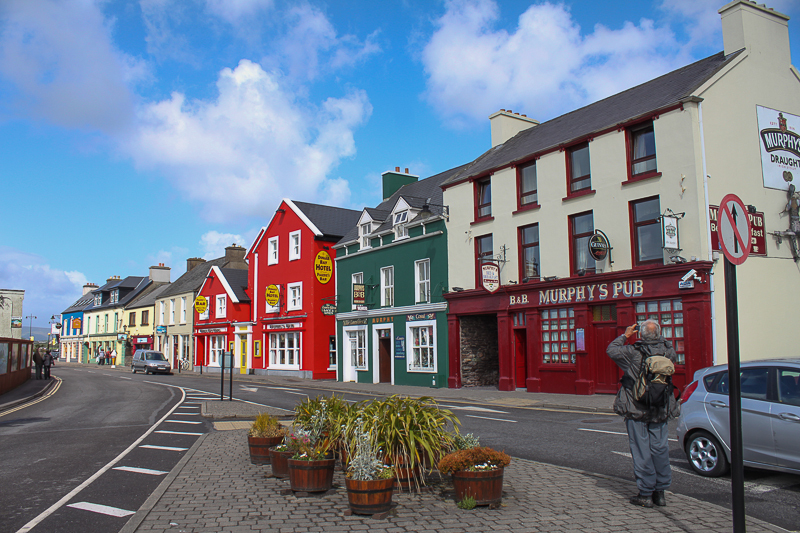 Dingle town itself is a thriving fishing town and offers plenty of opportunity for shopping or simply savoring the atmosphere of a typical country Irish town with its plentiful pubs, narrow streets and busy harbor. The road around the Peninsula is truly spectacular. It passes through a chain of Mountains, called Slieve Mish. From Inch, a long beach bordered by dunes and made famous by David Lean’s movie “Ryan’s daughter,” admire the Iveragh Peninsula and Rossbeigh Beach. From Dingle, drive around the coast to Slea Head. Here the blue of the marine landscape surrounds the Blasket Islands, deserted since 1953. In the distance are the two rocky Skellig islands, where the ruins of an early Christian Monastery can be found. The Dingle Peninsula will charm you with its villages painted in bright colors and will bewitch you with the dramatic beauty of its landscapes. Visit the Blasket Island Centre in Dún Chaoin (Dunquin). 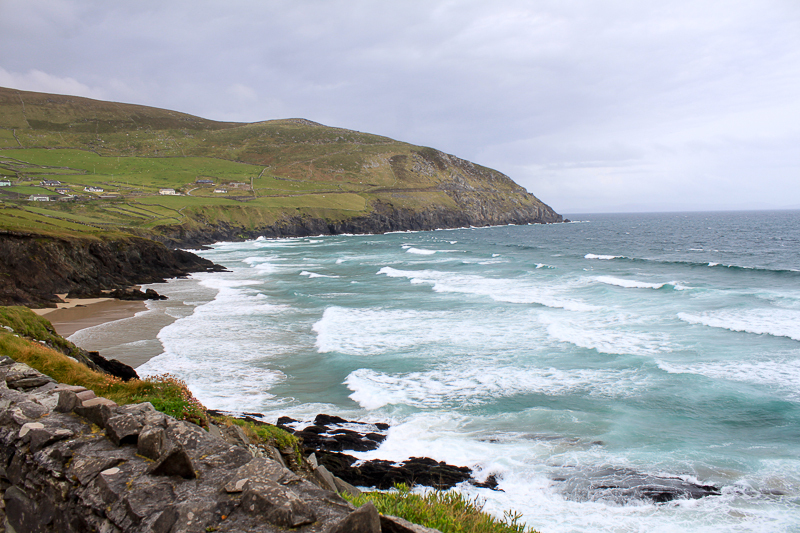 It is located on the tip of the Dingle Peninsula, and is a celebration of the story of the Blasket Islanders. It celebrates the unique literary achievements of the island writers ~ native language, culture and tradition. Sadly the Great Blasket was abandoned in 1953 and this caused the decline of its once vibrant population. The centre provides an incidental showcase of marvelous stained glass, ceramics and weaving. Walk along Mount Brandon (weather permitting). Ride out to the base of Mount Brandon, the holy mountain associated with St. Brendan. This is where St. Brendan spent 40 days in meditation and heard the call to set out on a voyage to find the “Promised Land.” He launched his boats from the base of this mountain and sailed away. When he returned he founded several monasteries and became known as “Brendan the Navigator.” We’ll take a 2 hour walk along the mountain and take in spectacular views of the Atlantic coast. Lunch and dinner under own arrangement. Overnight – Dingle Benners Hotel. Enjoy a private tour with Dennis Ryan, a Dingle local guide who will show us local archaeological sites such as the Dunbeg fort, monastic beehive huts, the Gallarus Oratory, ogham stones and more. Dennis is a wealth of information and will give you a deeper look into the Dingle landscape. Enjoy the balance of your day at leisure in Dingle town. Head back to County Limerick and visit Lough Gur, an enchanted lake near Ireland’s largest stone circle. There is magic in the beauty of the lake and hill, in the profuse and diverse flora and fauna, in the rich heritage of fact, myth and legend, that is Lough Gur. The real magic is in that it has been a place of continuous habitation for at least 5000 years since the arrival of the Neolithic people the first farmers. They, and the passing generations, have marked the locality to speak to us, and to its many visitors. The area around this small horseshoe shaped lake is of great archaeological significance. Visit Lough Gur Visitor Centre. The story of Lough Gur is told in the excellent Interpretative Centre. The visit commences with an audio-visual in thatched replica of a Neolithic hut, and continues with a guided tour of the historic site. Be prepared to see megalithic tombs, stone circles, standing stones, Bullaun, ring forts, ring barrows, cist graves, and crannogs. The story continues in stone, fort and castle, in medieval church and holy well. If your interest is in ancient history this is the site for you. Visit Grange Stone Circle. The Irish name for this is Lios na Grainsi and it translates to mean “Stones of the Sun”. This was built around 2000 BC by the people who brought metal and beaker pottery to Ireland. This site is older than the later phases of Stonehenge’s construction (Stonehenge was built in 3 phases between 3000 and 1600 BCE). 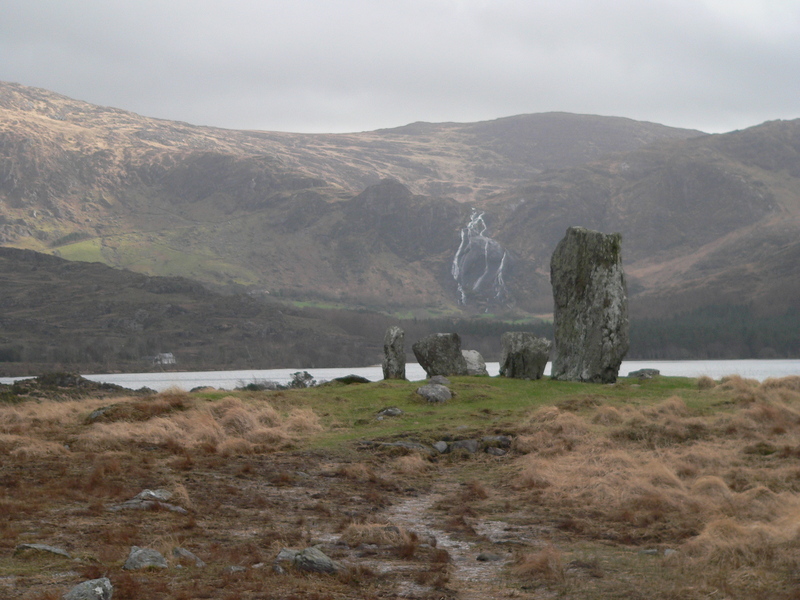 The Grange is the largest standing stone circle in Ireland and one of the most impressive. Continue to Ennis and check into your hotel, then get ready for your Farewell Dinner. This will be a unique experience as you will be ferried away to a restored 15th century castle and enjoy your meal in Medieval surroundings. The Bunratty Castle Medieval Banquet will be your final tour experience. Bunratty Castle, was built in the 15th century by the Earl of Thomond and stands on the banks of the Rathy River. For over 40 years the ladies of the Castle, aided and abetted by the Earl’s Butler, have welcomed guests from all over the world to join them at The Earl’s Banquet. The evening begins with a mead reception in the Great Hall of the castle, then downstairs to enjoy a four course meal with red & white wine. This is followed by entertainment by the world renowned Bunratty Castle Entertainers accompanied by harp and violin. Overnight in Ennis at the Treacy’s West Country Hotel. After a final breakfast at your hotel, transfer to Shannon Airport for your return flight home. RESERVATIONS: To book your reservation download the registration form.